Our 'AA' golf balls may have a small scuff mark or a little more magic marker than would the 'AAA' golf balls, but no club marks, bubbling clear coat or cuts. These balls are all perfectly fine for play, but the shine or general appearence is down a bit. These are just a great mix of average condition golf balls. Slight discoloration may be included. 100 AA Titleist Used golf balls (100 ct.). 100 assorted great, playable Titleists. 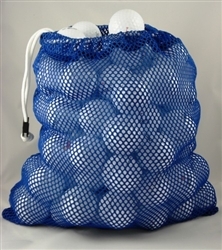 Quality nylon mesh bag additional $5.00. I received my first order of 100 AA Teitlist balls and I am very satisfied with what I purchased. The balls were as advertised thanks AAA Golf i will be a returning customer. Initially I was not optimistic about my order. Due to human error my email confirmation was not sent, but when I enquired about my order and delivery date I was promptly responded to by customer service. They were very friendly and my order was received in 3 business days. My AA quality balls were just that. Not the best but all in playable condition. Great deal at that price. Great balls for the money. Very happy with your aa grade.